Masons’ Temple Lodge: Not The Scariest Building In Westport. My Bad. A couple of years ago I called the Masonic Temple on the Post Road “the spookiest spot in Westport.” In the Comments section, Tony Giunta invited me to come see how un-scary it was. 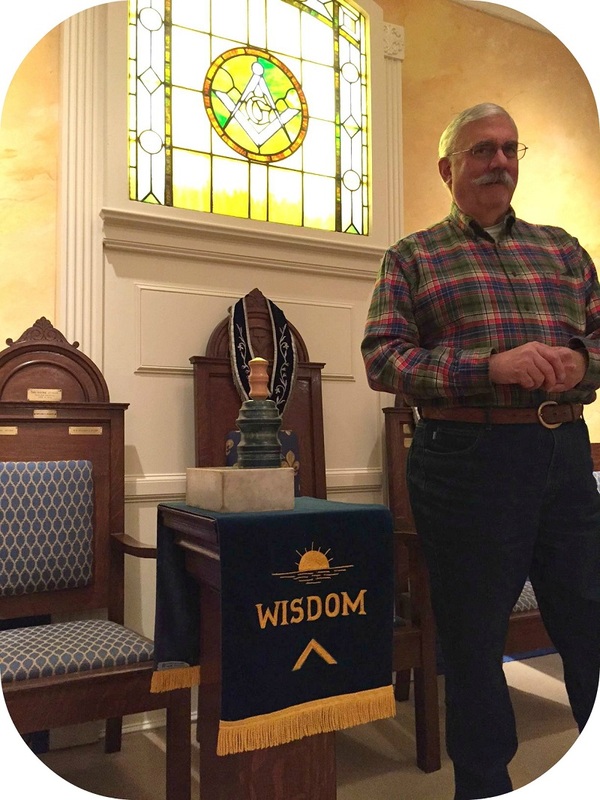 Recently, the 1964 Staples grad — and current Worshipful Master — repeated the invitation. The other day, I took him up on his offer. 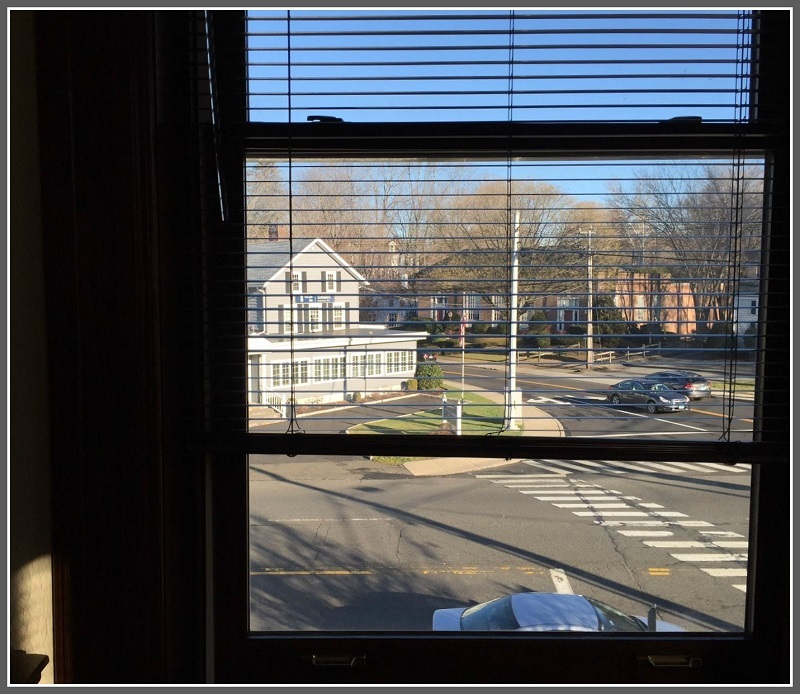 Despite occupying the top 2 floors of a building that also houses a funeral parlor, the building on the corner of the Post Road and Imperial Avenue is not particularly spooky. 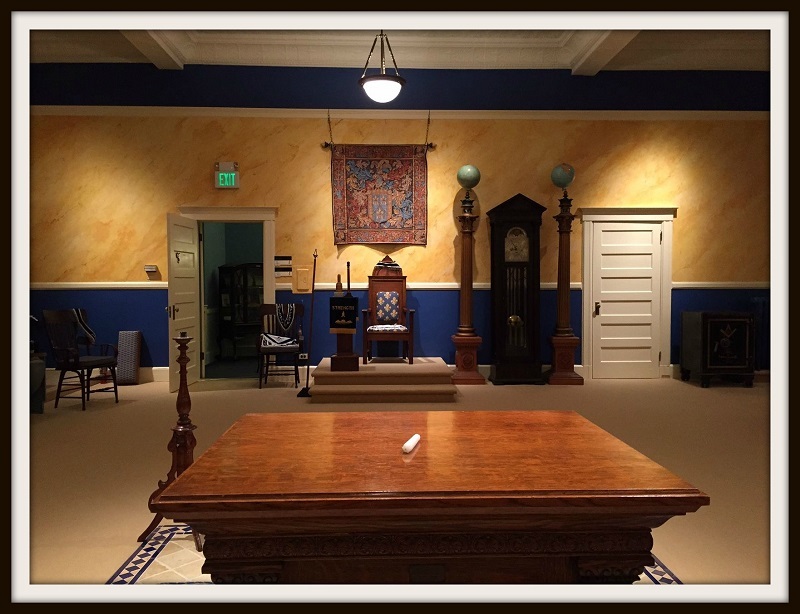 Our Temple Lodge #65 has been around since 1824 — more than a decade before Westport itself was incorporated. After convening at various spots (including National Hall), the local chapter of the centuries-old international organization moved into the then-new building in 1911. The Masons have been there — meeting the 2nd and 4th Thursday of every month — ever since. There are now about 100 Masons, though a typical meeting draws 40 or so. The lodge includes a parlor, dining room, kitchen, library, foosball room and large meeting room. The meeting room includes a clock from Jason Robards’ estate, and an altar. “We’re not a religious organization. But to join you must have a belief in a Supreme Being,” Tony explained. Meetings are governed by rituals, but include committee reports, information on the welfare of brothers, and discussions of charitable works. Tony joined in 2007, after retiring from the Westport Police Department. He’d been a Kiwanis Club member and worked with the Y, but had always wanted to be a Mason. Tony Giunta, in the meeting room. He proudly showed me a list of previous Masters. Well-known Westport names like George Constantikes, Don Goss, Tom Hofstetter, George Underhill, Carl Cirino and Rocco Frank are inscribed in careful calligraphy. In earlier times, the list included Westporters from famed families like the Fables, Wakemans, Sniffens, Bradleys and Krauses. 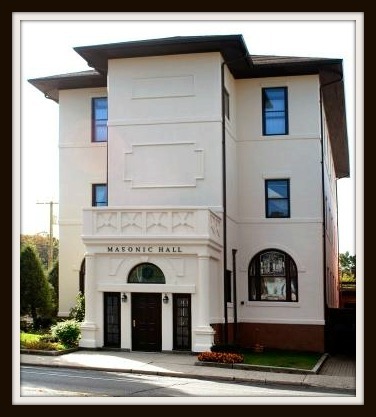 As Tony conducted his tour, I realized that the Masonic Lodge is not a scary building. Instead, it’s simple — and historic. Plus, it’s got a killer view of the Memorial Day parade. Every May, the Masons gather there. When it’s over, the bagpipers come upstairs. And then the real party begins. The downtown view, from Temple Lodge #65. This entry was posted in Downtown, Local business, Looking back, Organizations, People and tagged Harding Funeral Home, Temple Lodge #65, Tony Giunta, Westport Masonic Hall. Bookmark the permalink. I loved the Masonic Temple in Amarillo, TX. It had a golden life sized camel, a huge statue copy of the Egyptian Sphinx and Palm Trees on 3 floors. My dad was a lifer Mason, and my mother was Eastern Star. I could have been a Rainbow girl, but was too busy with Girl Scouting. In 1951 my parents brought me to NYC for my first time to attend a weeklong Shriners’ International Convention. So exciting: we stayed at the Plaza. Nice Post. Thanks for the insight! I thank you once again your unique info, I always wondered and didn’t know which door to knock on to find out about the Masonic Temple part of that building. My step-dad was a proud Mason all his adult life as an engineer. His Ashlar order was in Fairfield. It’s a great building. Our Saugatuck Congregational Church Youth Group was graciously invited to use there space periodically after the fire. And it’s also a terrific organization. They support CLASP Homes, and many other local charities!! And what can you say about Tony – one of the best guys on the planet!!! !